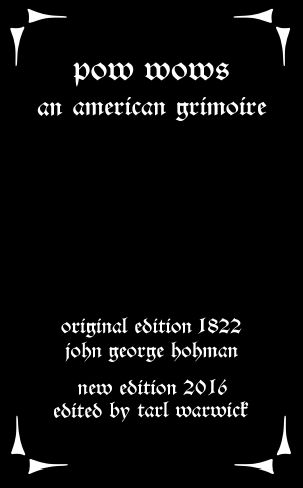 John George Hohman’s Pow Wows: An American Grimoire – Now Available! John George Hohman’s “Pow Wows” is one of the best occult texts I’ve edited. Dating to the 1820s, it was spawned by the Pennsylvania Dutch folk traditions of the era, and may be variously seen as Americana, German-derived occultism, a grimoire, or a snake oil combination of herbal and prayer book. Within this edition I retained the publishers’ inclusions (which Hohman did not write) because they were present in the first edition, but removed the long and largely pointless running index, which for some odd reason was at the end of the work when it ought to have been included as a condensed table of contents. The material covers herbal medicine, folk healing, prayers and invocations, a few magickal formulae, the construction of a couple of simplistic talismans (on paper) and protective spells, as well as hex breaking. Author styxhexenhammer666Posted on July 31, 2016 August 3, 2017 Categories 1800s, 19th century, 19th century occultism, american grimoire, folk magick, folklore, herbal medicine, hohman pow-wows, john george hohman, long lost friend, Pennsylvania dutchLeave a comment on John George Hohman’s Pow Wows: An American Grimoire – Now Available! Update 2: I am going to expedite the Ars Goetia if it is within my capability to do so. Update 4: Sickness in Hell will be taking rudimentary form over the course of August and I hope to release it before Halloween. If not, it will definitely be done before December. 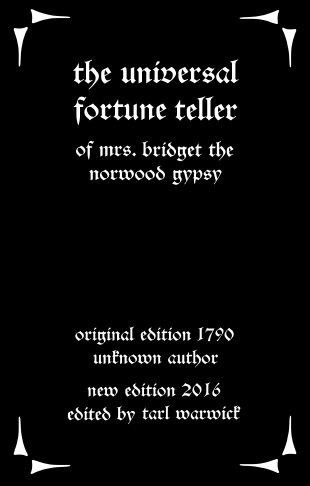 Now that the Universal Fortune Teller of Mrs. Bridget is complete, it’s time for a new edited work; and thankfully this time it’s in semi-modern English and comes from the United States. Hohman’s “Pow Wows” has nothing at all to do with Mesoamerican ritualism; which is funny given the connotations of the title- instead, it’s a fusion system between German ritualism (influenced, as I will explain, by French ritualism) and Americana, a Pennsylvania Dutch tradition from the dawn of the 1800s. The work itself is about the same length as, and contains some material similar to, the Petit Albert of 1700s era French renown- in my estimation the French cycle has influenced the content of this work, based on its eerie level of similarity- although it is within the realm of possibility that the similarities are due to traditions which were simply popular enough to have spread around Europe; after all, there’s no certainty that all content in the Petit Albert originated in France (indeed, it mentions Hungary and other regions explicitly for a few of its passages.) It’s broken into similar sections and covers similar maladies such as the bite of mad dogs (rabies of course) and headaches, hysteria, and other conditions. One part herbal, one part prayer/incantation booklet, and one part folkish tradition, this rivals the Petit Albert for “most in depth ritual system” I have ever edited. It is likely that I will list this with the grimoires, since that is essentially what it is, even if it is also technically a work of folk magick. I expect that it will be around 110 to 120 pages when completed, and it’s quite a nice work. The Universal Fortune Teller of Mrs. Bridget – Now Available! The 1790 Universal Fortune Teller is not attributed to Napoleon, although later works containing similar (and sometimes utterly plagiarized) content were. This text contains an elaborate backstory in which the editor claims to have obtained a manuscript from the thatched hut of an old wise woman who had recorded her occult findings in heiroglyphic form. Subsequent to cracking this mysterious code the work was then released. It’s fairly obvious that this backstory was an attempt to increase its circulation- but that doesn’t detract from the work, which manages to cover astrology, palmistry, and other tricks, rites, and knowledge into just under 100 pages of content. The astrological system here goes well beyond the simple Zodiac and into terms and meanings as well as arcane minutiae. With a slimmed down dream interpretation section and a buffed up card trick section, this work is comparable to Napoleon’s Oraculum in style, minus, of course, the oracle itself. It is also a rather bawdy work, mentioning whoredom, vixens, cuckoldry, and adultery quite frequently in the divination-by-card section. Author styxhexenhammer666Posted on July 27, 2016 August 3, 2017 Categories 1700s, 18th century, british, card tricks, dream interpretation, england, fortune telling, oracle, palmistry, universal fortune teller, universal fortune teller of mrs bridgetLeave a comment on The Universal Fortune Teller of Mrs. Bridget – Now Available! It is finally that auspicious time at which a new work by yours truly joins the (rapidly growing) ranks of edited releases available here on this blog. “Sickness in Hell” is the name and splatterpunk is the game; think, “Morbid Stories” as one long work instead of multiple short stories. Many years ago- almost a decade now- the rudiments of this novel began after I had a dream about eating a dehydrated fetus out of a wooden box full of dried apricots in a dilapidated, post-apocalyptic grocery store. After eating this strange sacrament (which I imagine must have been real in some other plane of existence) I became privy to looking beyond the psychological veil into a sort of weird hellish void full of depravity, death, terror, and perversion- and I enjoyed it. The corpus of the writing is basically complete already. The first step is merely to delineate the chapters and write notes outlining the basic content, after which the story writes itself- when writing fiction, as opposed to nonfiction, I zone out and it becomes almost a form of automatic writing; I say almost, because I don’t believe in actual channeling. It’s a novel-length work so it will take a bit of time, even if the twenty five original sections (technically chapters) are actually, technically, “done”. Unfortunately, the resulting story jumped around and so I can only say that it is complete in a very technical sense. The basic premise revolves around fungus capable of mutating DNA, factory farm contamination, Satan, and black magic. The entire work is the purest form of sickness and vile atrocity ever penned by a human being, and I take pride in the fact that a few people I showed some of the original sections got sick and began gagging. The 1790 version of the Universal Fortune Teller is indeed far stranger than the one I’ve already released which post-dates it by seventy years. One look at the content and you know you’re not exactly reading something from modernity. On the seventeenth day the child that shall be born will be foolish to that degree that it shall be almost unnatural, and thereby become a great affliction to his parents. To go on messages this day is unfortunate, yet to contract matrimony, to compound physical preparations, and to take physic is good, but by no means let blood. On the eighteenth day the child that shall be born, if a male, shall be valiant, courageous, and eloquent; and if a female, chaste, industrious, and painstaking, and shall come to honor in her old age. It is good this day to begin buildings; and to put out our children in order to be brought up in learning. Have a care of being let blood this day for it is very dangerous. On the nineteenth day the child then born, if a male, shall be renowned for wisdom and virtue and thereby arrive to great honor, but if a female, she will be of a weak and sickly constitution, yet she will live to be married. This day they may bleed that have occasion. These three short sections are from the end of the astrological work, regarding the birth of children at various stages of the lunar phases. As we see, bloodletting is encouraged according to the day, and what we term a “voyage” or “trip” is (and this is replicated in the work at least two other times) referred to as a “message.” I am leaving some of the antiquated English intact in this work for stylistic purposes, where a modern individual will still be able to infer the meaning from context. This work, oddly, appears to contain less of the “females are only interested in marriage and lovers” content than the 1860 version; indeed, some of the passages refer to women of a vaguely heroic or brawny constitution depending on the circumstance of their birth. This probably relates to the growing moralism of the mid 1800s as opposed to the lingering flames of the enlightened times of the 1700s and the philosophy from that same era. Today is a bit of a slow day on the literary front because of other work I had to do; that doesn’t mean I didn’t wish to make a post here though. The preface of the 1790 Universal Fortune Teller is done (quite a feat because of the condition of the manuscript and the language used there) and I’m settling in to some wine and relaxation. It seemed like a good idea to post some of the music I listen to while editing and writing; I would have embedded the links but it seemed easier to just link them normally. Author styxhexenhammer666Posted on July 17, 2016 Categories ancient music, coven, editing music, esoteric music, hexentanz, literary music, nest, occult musicLeave a comment on Off Topic: Work Music!